Upper Cervical Chiropractic is a special technique used by only 5% of all chiropractors in the world. What separates Upper Cervical care from most common forms of Chiropractic techniques is the absence of the cracking or popping of vertebrae. Dr. Octavio Espinoza's method only requires the adjustment of two bones at the very top of the spine. By making these simple adjustments it allows the spine to open up and unblock the pathway for your brain to communicate with your body, increasing all cognitive and bodily functions. Why should I choose Upper Cervical treatment vs traditional methods? Most people come to our office seeking a solution for the symptoms of an underlying issue. These symptoms are just a way your body is communicating to your brain, There is an underlying problematic process occurring, but the brain in most cases is not able to respond due to a subluxation. Dr. Espinoza specializes in detecting and correcting subluxations and that allows the brain to detect and correct disease processes through the body. The subluxation is corrected by a specific upper cervical chiropractic adjustment; during this correction process the patient is suggested to get adjustments 2-3 times per week for 4-12 weeks. This phase will offer a balance neurologically and structurally, creating a natural internal resistance in your body. Restorative care is base in structural changes, which requires more time to fulfill. The repetitions of the adjustments train the Atlas bone to maintain its position in order to allow the entire spine to relocate into the proper anatomical position, when this position is reached it will be a permanent correction because the body performed all those change without manipulating the entire spine to force it into position. During the restorative care phase it is suggested to get check about 4-8 times per month for 3-6 months, depending on your individual healing capacity. Maintenance care is aimed at allowing us to avoid problems in the future. Subluxations are produced due to physical, chemical or emotional stress. Which is to say, if you are alive, you will most likely be dealing with stress. During the maintenance care phase we allow the patients to continue their normal lives and routine while working in sessions to ensure long term health benefits. This phase of care typically only requires 1-2 visit per month or every other month, based on your lifestyle and condition. Never received upper cervical spinal care? Come see what it's about! The doors at Regenerative Chiropractic are always open. Dr Espinoza loves educating patients and will provide a consultation and dig deeper into what ails you. Your treatment and plan is centered around your body's specific needs! Dr. Espinoza believes in providing an improved quality of life for all. Even if you don't have Insurance we can still treat you! Affordably! Our technique doesn't involve gross manipulation of the spine. It's painless! Dr. Espinoza is not one to keep a good thing to himself. He is a firm believer in community participation and education. Regenerative Chiropractic is a family owned business and we believe that it is important to give back to the community and enrich their lives by doing what we love to do. Dr. Espinoza has been serving the South Florida community since 2012. He uses upper cervical chiropractic care to improve the overall health of his patients, not only to reduce their symptoms, but addressing the cause of their ailment. Erika Espinoza works alongside her husband in delivering excellent service to all of Regenerative Chiropractic's clients. She oversees all daily office operations. 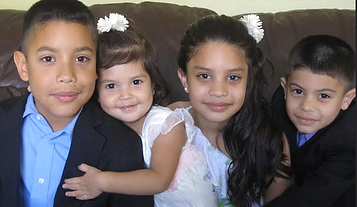 The Espinoza children are the inspiration for Dr. Espinoza's vision of a bringing a healthier life to families everywhere. They are the future and the future should always be bright.